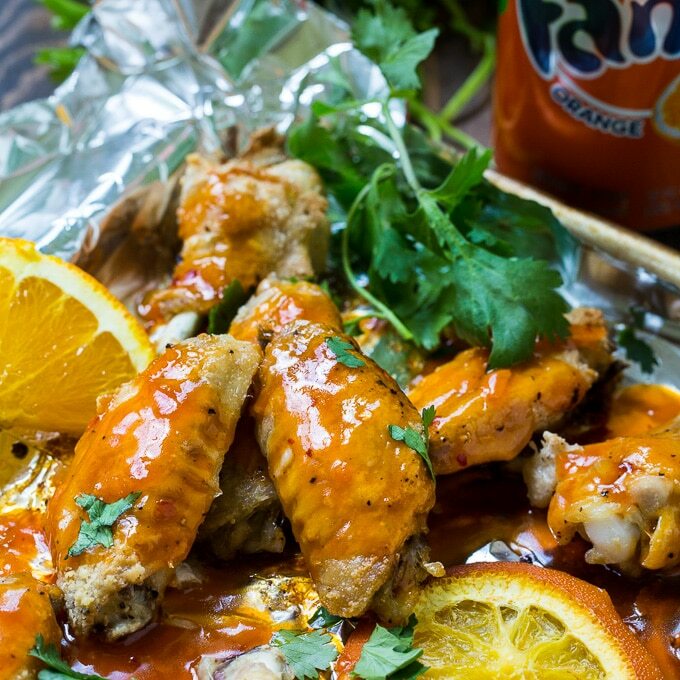 Orange Soda Hot Wings are the perfect sweet and spicy appetizer for game day. Chicken wings are coated in seasoning and baking powder and baked in a hot oven until crispy. Then they are tossed with an orange-flavored sauce and sprinkled with cilantro. Baking chicken wings is so easy and they are much healthier than fried wings. Coating the chicken wings with baking powder helps them crisp up in the oven. The wings are cooked at 2 temperatures. First they are baked form 30 minutes at 250 degrees and then another 30 minutes at 425 degrees. This ensures they are cooked through but also get crispy. The sauce has a wonderful orange flavor and a bright orange color. I use a cup of Fanta Orange, but Orange Crush would work well too. A tablespoon of orange zest adds more orange flavor. There’s also a few tablespoons of brown sugar in the sauce for sweetness. 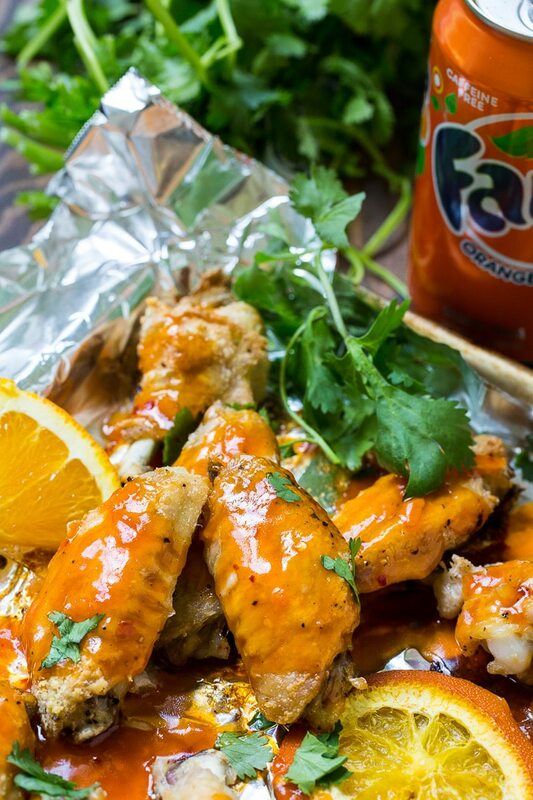 To balance the sweetness in these Orange Soda Hot Wings, there’s 3 tablespoons of hot sauce and a few crushed red pepper flakes. I use Frank’s Red Hot Sauce. It has the perfect flavor and heat for hot wings. 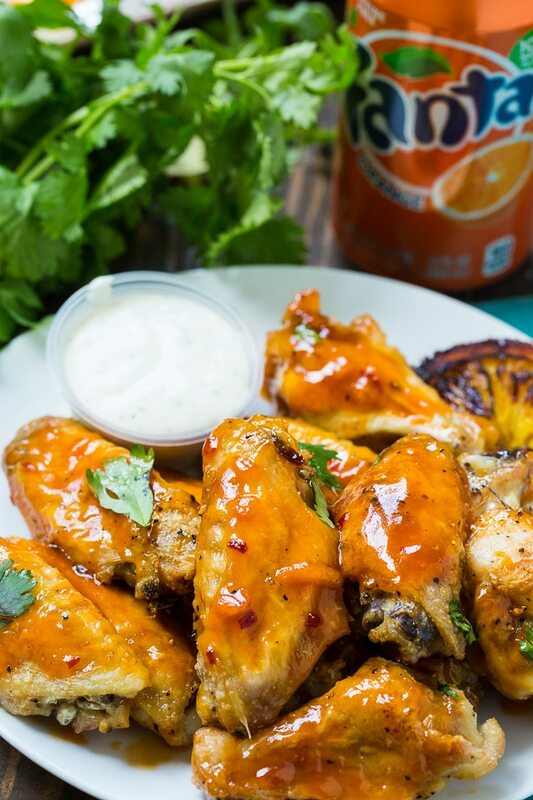 With their wonderful crispiness and the sweet and spicy flavored sauce, Orange Soda Hot Wings are sure to be a fan favorite. 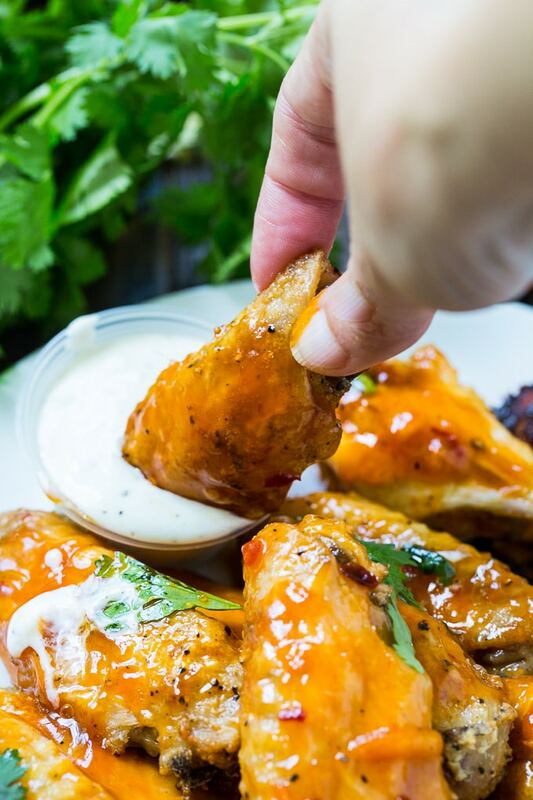 No need for a deep fryer to get wings crispy. You can coat them with baking powder which helps dry the skin out and allows it to get crispy as it bakes. Some people find that baking powder has a bitter taste. For best results, use an aluminum-free baking powder. Serve with either a ranch dressing or a blue cheese dressing for dipping. In a large bowl, toss chicken wings with salt, pepper, garlic powder, onion powder, and baking powder. Place skin side up on prepared pan. Bake for 30 minutes. Increase oven temperature to 425 degrees and bake another 30 to 40 minutes. Meanwhile, make the sauce. In a medium saucepan bring orange soda, hot sauce, brown sugar, butter, orange zest, soy sauce, red pepper flakes, and cornstarch to a boil. Reduce heat and simmer for about 20 minutes or until thickened. 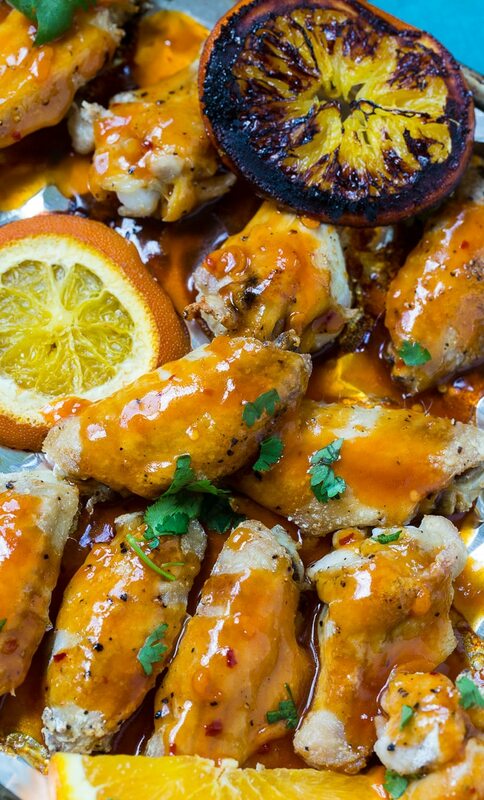 Toss wings with sauce and sprinkle with cilantro. This entry was posted in Appetizers and tagged chicken, orange. Bookmark the permalink.